Alessandro his name, Rossi his surname. A common name, how many in Italy named so? But a player that is able to score nine goals in four matches cannot be just one of many. And the Alessandro Rossi we are talking about, numbers at hand, is not one of many. He drives the attack and the game of SS Lazio Primavera. Lazio is his favourite team. Not just words though, because he showed it with facts already a long time ago. After he knew football when he was about 10 years old, in a tournament in Pianoscarano the 1997 born footballer showed his talent in front of many concerned eyes. There were the biancocelesti scouts obviously, but also the colleagues of the AS Roma. 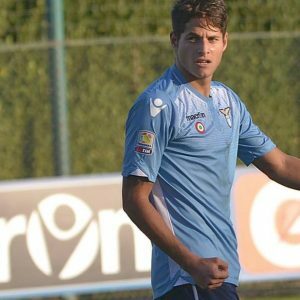 Both capitoline club offered him the chance to a trial, but he didn’t want to hear the offer of Roma: his heart was only for Lazio. From the trial and the subsequent landing at Lazio, Rossi begins his journey in the academy who gave birth and grow until today. But, before he started running after a ball, the young Alessandro showed talent with another balloon, an orange one. He practiced basketball and he had talent for sale: “He was releasing all his energy in sport – tells Fabio Guardabasso, his agent –. As a child he was a devil, he never stopped for a second. His Mum Angela has had an hard childhood to manage with him: he was hyperactive“. She was the person that followed and accompanied him in football from an early age, making sacrifices along with his son. Meanwhile Guardabasso today care his interests, but until a few years ago he watched him from the stands as an observer: “When I saw him play, he excited me. She always stole the eye“. And not just him, because ever since he played in the under-15s, he managed to draw upon himself the attention of many professionals. 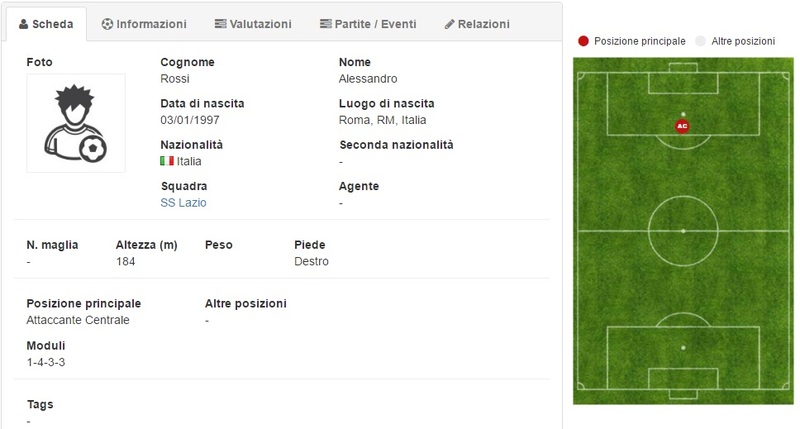 He was just 14 years old and some Italian, and not, clubs monitored him. There was a manifestation of interests in 2013, when Manchester United made an offer for Alessandro. But he, in concert with his mother, declined to move across the Channel: he still felt too young. The injuries, like it happens with many players, have undoubtedly curbed his growth. Until they were finally resolved and Rossi has been able to unleash his full potential. At the end of the last season, the prize for the best player of the Italian Young Final Eight he was ripped by his teammate Lombardi. But, undoubtedly, that was an opportunity to show another time all his repertoire. From there he started to receive more offers, to which, however, has not been acted upon. Just last Saturday, during the match won against Spezia (two goals for him), a scout of Manchester City came to see him. Another testimony of the goodness of his work: “All this is flattering. It suggests that the player has got important perspectives. Alessandro knows that if he has got some goals, it’s up to himself to reach tem, but he still has something to prove. Today he is working hard for his growth, he is fine at Lazio. He is a guy with his feet on the ground and he doesn’t think about tomorrow, and is happy as well“, says his attorney. I mean, paradoxically Rossi has received and is receiving more attention from English clubs than the Italian ones. Perhaps because of its characteristics, or perhaps for some other reason related to scouting. Guardabasso is in favour of the second hypothesis: “In Italy scouting does not work. But not because there are no capable and professional insiders, far from it. Rather because, very often, those who make scouting is not taken into account by clubs because there are other interests. There are a lot of good observers around, but their relationships end up in garbage bins. This happens for various reasons outside of scouting activities. The same can be said regarding our nationals: circulate always the same names. If we have few talents is because there is little quality, but sometimes it happens that the quality is not rewarded. When I read certain caps on the national team, while respecting them, I think you commit mistakes. Do not select what best serves our League, but you would rather convene always more or less the same. It seems that there is a hint of superficiality regarding youth. These are things that penalize Italian football and local talents“, he says firmly. About national, Italy would need more players like Rossi. Forward thinking modern, fast, with great imagination and capable of covering multiple roles of attack than the classic first round. His best quality is the ability to read the game well and fast, what it lacks in so many in her role. Lazio lends a helping hand to fellow and is at the service of the team, acting almost as a Director. And who knows could become a real filmmaker if someone had worked on him as a player. The head and not without vision. Natural right but able to kick with the left, makes the physicality his strong point and has a very high base technique. His explosiveness from a physical point of view makes it very strong in the air, where is good at choosing the right time. In one on one is aided by his quick thinking, which can overcome the toughest defenders. Don’t ask him to applause with a single play, but the nastiness of the striker and altruism of Director make it the ideal prototype of the modern striker.